To Increase the agency’s bottom line, the answer isn’t running faster, working longer and saying ‘yes’ to everything. Do you start each day with more on your to-do list, more unanswered emails and feeling more puzzled how you will manage it all? Do clients give you less and less time to do more? Do they give you smaller budgets and expect better results? How well do you juggle the pressure of today’s relentless workload? Do you need to read more as your mind drowns in a tsunami of information and data? Do you feel a need to check your smart phone every few minutes? For many our typical reaction to the above is to work harder, work longer hours and run faster from one task to another. 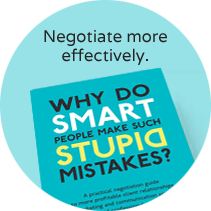 How much of the pressure is from your clients, how much is from your boss and how much is self-inflicted? Do you have clients for whom everything is last minute and at rush? Rushing has become the new norm. Rushing becomes habitual and yet when we rush we are less likely to do our best work. Instead we do work which is ‘ok’. Our clients make out that the rushed deadline is the most important goal. Yet once the work is delivered the crazy deadline is quickly forgotten and what now becomes critical to the client is the Result. Clients quickly forget the tight deadline they originally gave us. The other dilemma is that when we rush we are more likely to make mistakes. Mistakes are costly to us in several ways. Firstly to put them right – and at our cost and now at even greater speed. Secondly the client, or our boss, is now questioning our ability. Thirdly clients and bosses have an uncanny knack of remembering our mistakes long after we’ve put them right. Here are 10 tips to help you work smarter, not harder. Understand what your clients really value. Focus on how you can deliver more value. Get better. Be the best at what you do. Don’t be average at many things. Be outstanding at one or two things. Specialise. Focus on your top priorities first. Have clear goals and avoid being distracted by the minutiae of business. The more senior we are the more vital it is to take time to stop, think and plan. Decide what is urgent and what is important. Find time to slow down. Find at least 1 hour each day, 2-3 hours each week, 1 day each month to really think. Slow down to go faster. Work ON the business, not just IN the business. Get away from your desk to really think creatively and innovatively. Typically our best ideas come spontaneously when we least expect them. Know when you personally think best – it may be in the shower, walking by the river or even with a glass of your favourite tipple! There is no single right way but know what’s your right way. Push back. Be brave and push back on ridiculous deadlines and insufficient budgets. Will you always get more budget or more time – of course not. But you will get more time much of the time. Think carefully before you automatically say ‘yes’ to every demand. 50% of your problems are probably caused by you saying yes too easily in the past. Anticipate what is likely to happen. Consider the various options that are likely and how you will respond. When we are under pressure we often don’t think through the implications of our options and decisions. Take control of your future. If you don’t then who else will? Solving problems on your own can be over-whelming and we may be more emotionally caught up in the issue. Find a buddy. Chat through problems and ambitions with them. By explaining your challenge to them forces you to clarify your thinking. They will often give you a fresh perspective. Do it, delegate it, or dump it. Don’t procrastinate. Be decisive. Find ways to be more effective on tasks which are repeated. How can you find systems and methods of working to reduce the time involved and improve the quality? See clients as investments. Focus on the most important, those which provide the most lucrative and profitable revenue. Smarter thinking will enable you to achieve more success.